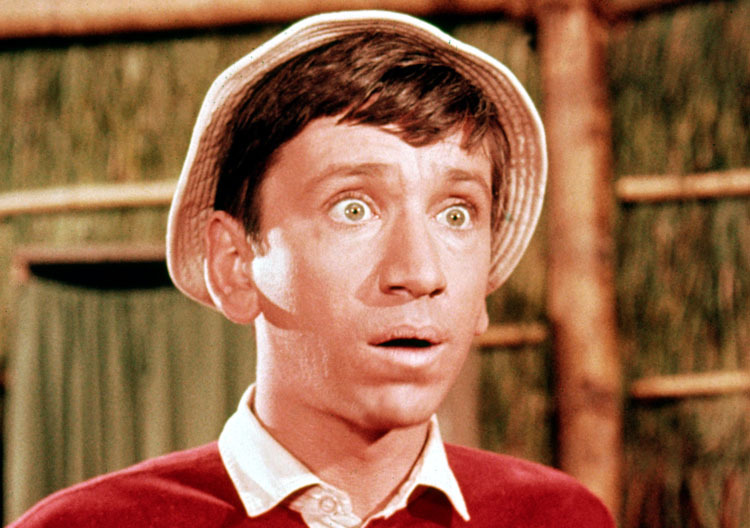 Bob Denver was born on January 9th, 1935. It's been eleven years since he passed away. He is best remembered as Maynard G. Krebs from The Many Loves of Dobie Gillis; He was "Dud" Wash, Charlene Darling's husband on The Andy Griffith Show; cab driver Rufus Butterworth on the short-lived The Good Guys; Dusty on the equally short-lived series Dusty's Trail; and Junior, a NASA maintenance man lost in space on the Sid & Marty Kroft series Far Out Space Nuts. His greatest and most-identifiable role is as the title character on Gilligan's Island. 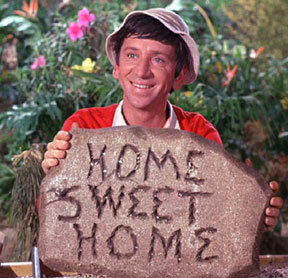 After three seasons, he joined the original cast, except for Tina Louise for two cartoon series - The New Adventures of Gilligan and Gilligan's Planet - three live action reunion films - Rescue From Gilligan's Island, The Castaways of Gilligan's Island and The Harlem Globetrotters on Gilligan's Island - as well as a behind the scenes documentary about the series Surviving Gilligan's Island. So, here's what I'm thinkin': legend has it that Sherwood Schwartz, Gilligan's Island creator took a roll of butcher paper and filled it with story ideas for the series. Pause, if you're not familiar with what "butcher paper" is, it's the white paper that meat is wrapped in at the meat counter at the store. Take as long as you need to figure out how a television comedy writer got his hands on a roll of butcher paper. Schwartz did, filled it with story ideas. The show lasted only three seasons. There still had to be more ideas on that butcher paper, 'cos there were 24 cartoon episodes of The New Adventures of Gilligan from 1974 to 1975 and 12 episodes of Gilligan's Planet from 1982 to 1983. The concept was recycled on Dusty's Trail for another 26 episodes. So, here's my question: Sherwood Schwartz wrote jokes for Bob Hope. The Adventures of Bob Hope ran from 1950 to 1968 and produced 109 issues at DC Comics. 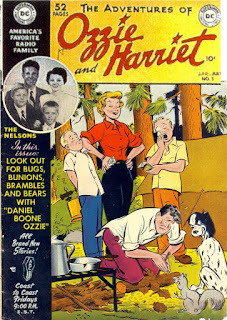 Schwartz also wrote for The Adventures of Ozzie and Harriet. The Adventures of Ozzie and Harriet was another DC Comic that produced five issues from 1949 to 1950. Schwartz was also a writer for My Favorite Martian. 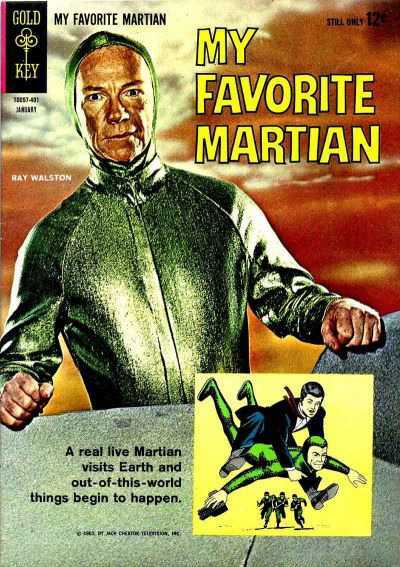 Gold Key produced nine issues for My Favorite Martian between 1964 and 1966. 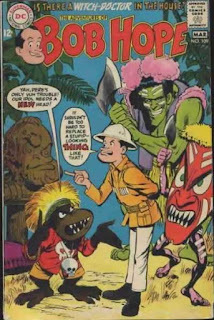 Okay, here's my actual question: why wasn't there ever a Gilligan's Island comic book? Sherwood Schwartz worked with at least three television properties that were developed for comic books. Bob Hope led the pack. DC Comics produced a very successful Jerry Lewis comic book that started out as Martin and Lewis before the comedy team broke up. Red Skelton was another comedian that Schwartz wrote for. Skelton was featured in a comic book started in 1936 called Hullaballo; later it was called 1000 Jokes. In all, there were 109 issues between 1936 and 1969. Schwartz seems to be literally surrounded by comic books. With a property that would definitely have benefited from a comic book audience. If we're looking at it from a modern perspective. While it would have been awesome to have a Gilligan's Island comic book, or a tie-in comic book to either of the cartoons, I would hazard a few guesses why. 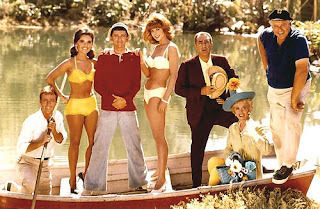 As entrenched in pop culture as Gilligan's Island is now, the show itself was a laughing stock while it aired. It struggled in the rating for three seasons. Network executives didn't want it on the air. Critics panned it. Modern audiences don't so much laugh at the jokes, but laugh at the concept. And yet, audiences are treated to homages to the show. 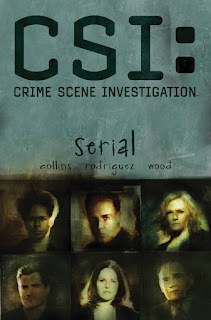 The series Lost is basically a re-working of the concept. Who knows what kind of audience the comic book would have drawn. Bob Hope, Jerry Lewis and the comedians of 1000 Jokes were lucky to hit over a hundred issues. Most sitcom comic book tie-in comic books didn't last very long. Most television series comic books don't last very long. There were a number in the 1960's. Not very many in the '70's. The concept of a TV series tie-in didn't come back around until the 1990's and the 2000's with CSI and 24. Science fiction seems to work better in comic books than comedy. Star Trek, Star Wars, Battlestar Galactica have all fared well over the years in the super-hero market. Espionage and action adventure does equally well; like James Bond. The old saying goes, Comedy is not easy. I would imagine that Mr. Schwartz spent so much effort working to keep the series on the air, that he might never have thought of a tie-in comic book. Which is a shame. It's also a missed opportunity. Word is Josh Gad is writing and starring in a new Gilligan's Island movie. Hopefully, it won't be terrible, like other updated properties have been. Maybe with renewed interest there might be a comic book tie-in. I'm not sure I would read a comic book for an all-new, all-different Gilligan's Island. Unless, Gad proved that he had the concept of seven stranded castaways that represented the seven deadly virtues the way Schwartz did. And he had the comedy down. I'm thinkin' that Gilligan's Island would have been, and probably still could be, a pretty decent comic book. There have been a lot worse ideas for a comic book. Most comic book publishers sometimes just throw books on the stands and see how well they do. Batman '66 lasted 30 issues. Ralph Garman, Kevin Smith, Ty Templeton and Alex Ross teamed up for a sequel to second season The Green Hornet guest appearance. 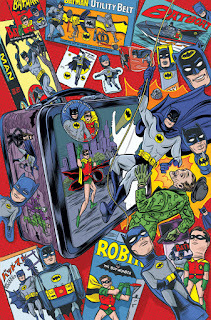 Batman '66 Meets The Man From UNCLE by Jeff Parker is currently on the stands. DC is also publishing comics based on the '70's Wonder Woman television series. Bob Gale, who was involved in the original Back to the Future is actually going back to fill in some blanks with an ongoing comic book series. Marvel has reclaimed the license for Star Wars. Star Wars and Darth Vader comics are among the top selling titles. Marvel has also published comics for Princess Leia, Lando Calrissian, Chewbacca - among other characters - with comics for Obi-Wan and Anakin and C-3PO coming. So, why not a Gilligan's Island comic book? I'd read a Gilligan's Island comic book. Would you? Hi Dave, cool site. I too often wondered why no Gilligan's Island comic book. If any tv series screams for a comic book Gilligan's Island would come off to me as more like Jerry Lewis. I mean Gilligan seemed to me as a Jerry Lewis character. Plus the whole cast are characters. They did 2 Saturday Morning cartoons that I enjoyed. I did hear rumors of someone trying to put out a Gilligan's comic book. As for a remake movie I hope they don't do it. I never seen a remake movie that I liked. Yeah, I'm surprised that there wasn't a Gilligan comic book - but sitcoms have been notorious for being a tough sell in comics. Except for The Simpsons, I guess. I have a hard time believing that Gilligan can be updated to modern times. Look at "Lost". Yeah it was a drama. I really liked the first season, up until they introduced The Others. I agree with you remakes almost never work. Yes!! I would love, read , and collect a Gilligan's Island Comic Book!! They did release a hard cover Novel however!! I found a copy several months ago. Really?! What's the title? Is it on Amazon? Where did you find it?